Tutorial: Getting started with PIC18F / dsPIC30F | ad hocumentation • n. fast, instinctive documentation of ideas and solutions. It would be useful to have snips and pliers too. MPLAB IDE v8.83 – This is the integrated development environment that Microchip (the company, that is) provide for PIC development. A newer cross platform version (MPLABX) is currently in beta, but I’m sticking with plain old MPLAB for the time being. 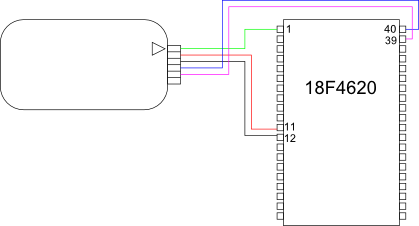 For PIC18Fxxxx development in C, I recommend using Microchip’s C18 compiler (aka “MPLAB C for PIC18 v3.40 in LITE mode”), which can be downloaded for free (although you will need to register your email address with Microchip). For dsPIC30Fxxxx development in C, I recommend using Microchips C30 compiler (aka “MPLAB C Compiler for PIC24 and dsPIC v3.30c”), which can be downloaded for free (again, you will need to register your email address with Microchip). 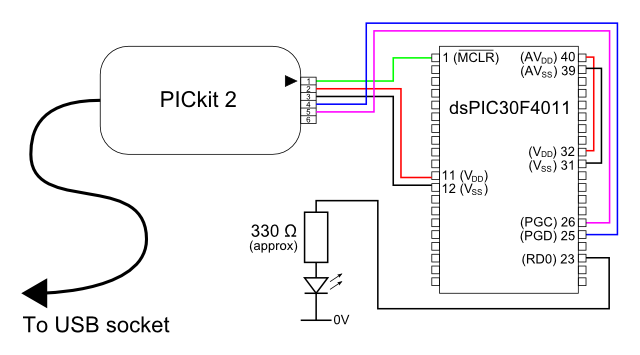 Finally, I recommend installing the PICkit2 utility application (PICkit 2 v2.61), which contains some really useful tools, including one which lets you use the PICkit2 as a simple logic analyzer and one which lets you display messages on the PC screen from a program running on the PIC. MPLAB should be installed first, followed by one or both of the C compilers (depending which chips you intend to use). During the installation process of each C compiler, if you are asked whether you want the compiler to integrate itself with MPLAB, say yes. Finally, (optionally) install the PICkit2 application (it’s not required, but it comes in really handy). // watchdog timer and low voltage programming. This entry was posted in Uncategorized and tagged 18F4620, 30F4011, C30, circuit, dsPIC, dsPIC30F4011, example, Hello World, PIC, PIC18F4620, PICkit 2. Bookmark the permalink. I have gone through your tutorial for dspic30f4011 and I have found it very useful and well organised notes. At the moment I am working on my final year project and I have generated two PWM with the same duty ratio that I can control those pulses by a potentiometer. I just need to make a phase shift of 180 degrees between them. Phase shift is very important and crucial for my project and I dont know how to make 180degrees shift between them. Can you please help me to do that. Great quick reference but the colours on the Vdd/Vss to AVdd/AVss links in the dsPIC diagram would benefit from being the other way around. Gosh, yes! Thanks for letting me know. I hadn’t noticed that at all. I’ve fixed it now. Actually, if you’re using XC16 (or MPLABX), then you only need to include the header file “xc.h” and the correct header file for your chip (i.e. “p30f4011.h” in this case) will be pulled in automatically. Both XC16 and C30 can be downloaded free of charge from microchip.com. Hey……thnks…for the turotrial.. I really managed to bring my own picmicro up and running. Pl. post.. more..and helps us to get better. You’re very welcome. Thanks for your kind comments.